The Bijou Theatre is most certainly a gem – in fact, translated from French it means jewel, and the name couldn’t be more appropriate. This highly polished, cultural masterpiece offers a diverse line-up of entertainment from all genres: film, theatre, music, comedy, and dance, among others. The theatre itself is unique and a delight to behold, with cabaret-style seating on the perimeter as well as center auditorium seating. There is a full bar with snacks as well as limited meal service from area restaurants available to those who are seated at the tables. No matter where you are, there is not a bad seat in the house. 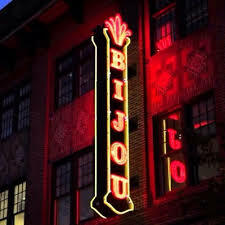 Ms. Brown couldn’t have been warmer; she has a diverse background (including a law degree) and big plans for the new face of The Bijou, one of the country’s oldest cinema houses. The recent appointment of Artistic Director Tony Stimac (director, producer, writer, teacher) whose resume is unparalleled and a mile-long, will serve to amp up the kind of dynamic offerings the theatre already presents. The cozy lobby oozed with patrons who were partaking in a delightful smattering of hors d’oeuvres and drinks until the show began. And. What. A. Show. It. Was! Ordinarily Wayne and I do our research first, but this time life had gotten in the way and we hadn’t. We had no idea for what we were in store. Now Mr. Berg is an American composer/lyricist with such notable creds to his name as The Prince and the Pauper, Grumpy Old Men: The Musical, Tim and Scrooge, The Man Who Would Be King, and most recently, The 12. But the enthusiastic and energetic music man obviously isn’t content to stay behind the piano entirely – he instead takes it on the road and brings the family with him. 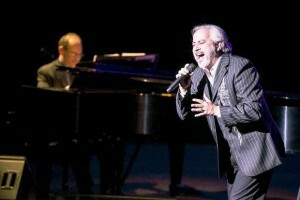 Berg has constructed one impressive show – accompanied by his songbird wife, Rita Harvey (Broadway maven and star of Fiddler on the Roof as Hodel and The Phantom of the Opera as Christine) and a handful of other Broadway headliners when their schedules allow (they vary from performance to performance). On this night, we were honored to be in the presence of several of the best voices I’ve ever heard; in addition to Harvey, we were blown away by the masterful talents of Richard Todd Adams (he’s played The Phantom, Jean Valjean, and Javert! ); Jeannette Bayardelle who has the most astonishingly mind-boggling pipes (having played Dionne in Hair, and Celie in The Color Purple); and Danny Zolli who is not only a phenomenal singer, but quite the entertainer and something of a change artist (he has performed in more than 26 productions of Jesus Christ Superstar worldwide, as well as sung for three American Presidents, The Papal Cardinal Delegation from Rome, and this list goes on). 100 Years of Broadway is the number one touring Broadway concert and all of its performers have starred on Broadway and in national tours. This is far from just a night of crooners belting out show tunes – it lends itself to the actual performance styles of the iconic songs. Berg also caters to the target audience at each venue, ensuring the songs are those with which the demographic will be familiar and that they will enjoy. And as those of us who truly know theatre recognize, with every fiber of our beings, when it comes to live theatre, there is just nothing better. Bringing on even more chills was Richard Todd Adams – I could listen to this man sing the phone book (not that they even make them anymore, do they?) When he broke into “Man of La Mancha” I was in awe. And when I saw Danny Zolli slip onto the stage midway through, the hugest grin spread across my face (I whispered to Wayne that he was about to accompany Adams in the Sancho Panza part) and he did so with uproarious gusto! But the pièce de résistance was when Adams followed with “Impossible Dream” – this may sound ridiculously corny, but it felt as if I was in a dream. 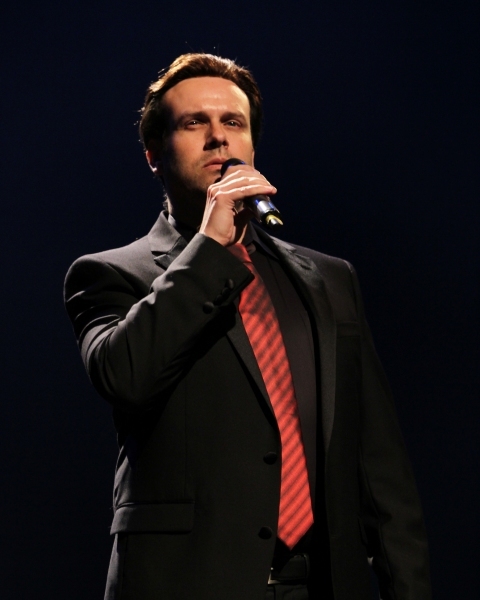 Zolli also was beyond incredible as he brought us “Bridge Over Troubled Waters” and Jersey Boys’ “Can’t Take My Eyes Off of You” and “Oh, What a Night.” Truly a chameleon, he switched from funny and charismatic to singing with such incredible passion. While many songs were sung as solos, there were duets as well as group performances. 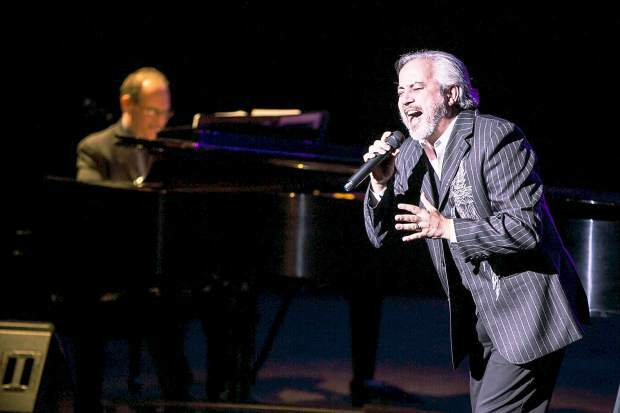 Harvey and Adams nailed songs from The Phantom of the Opera while the audience swooned, and the group highlighted the importance of “community” with “Seasons of Love” from Rent, nodding to the community brought together to support The Bijou. We heard songs from other iconic shows such as South Pacific, Oklahoma, The Sound of Music, Cabaret, and more. And an unexpected highlight to the evening was the amazing vocal talents of young Connecticut resident and Internet sensation, Taylor Felt. 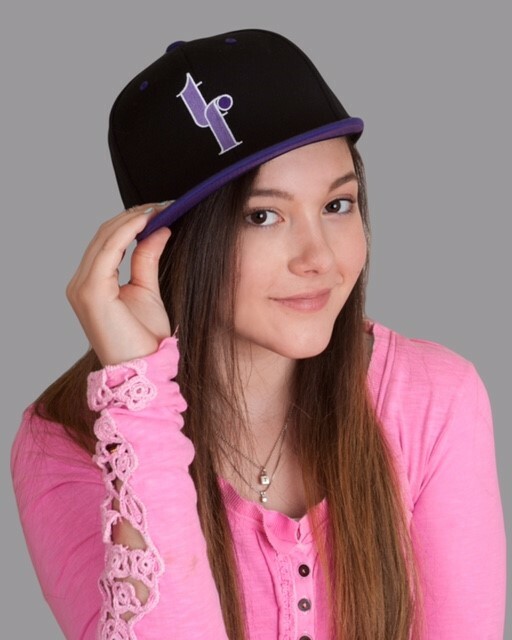 At the tender age of 14 she has been singing for 12 years! In her platform Converse All Stars she took the stage and did covers of Charlie Puth’s “One Call Away” and Kelly Clarkson’s “Invincible.” Her powerful voice hits the level of a seasoned professional, yet her youthful beauty endearingly betrays her. Also an actress, this gifted songstress just may be the future of Broadway! Many thanks to musicians, Roger Cohen on drums/percussion (he was spectacular! 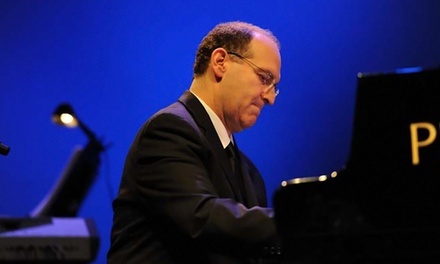 ), Abraham Saenz on bass, and of course Berg’s incredible piano and musical direction. A night of amazing wonders – a unique and remarkable venue and an outstanding night of entertainment. We most definitely want to catch Neil Berg’s 100 Years of Broadway again, and unquestionably will be back to see more of what The Bijou Theatre has to offer!!! 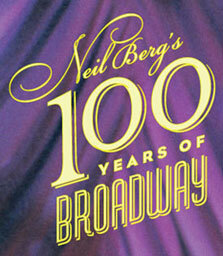 With Neil Berg’s 100 Years of Broadway, you NEVER get anything less than genuine, authentic Broadway. 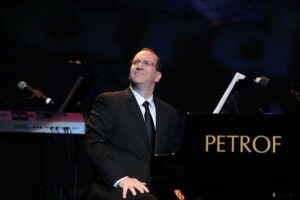 Neil Berg is an award-winning composer, lyricist and producer. Talk about multi-hyphenates! His high school batting average is pretty damn good, too! You find these facts not only on his website, but you learn these and more in between acts that he hosts in his 100 Years of Broadway. The concept is pure genius. Mr. Berg rallies his Broadway “buddies,” all top Broadway talent (including his wife Rita Harvey), and then introduces the performer and next song always with amusing and insightful anecdotes. Each show may be a bit different depending on venue, audience, and performer availability, but all of the acts are top-notch talents and Broadway veterans who will NOT disappoint. My wife (and co-reviewer) and I were lucky enough to be invited to a gala fundraiser by The Bijou Theatre in Bridgeport, Connecticut that featured Mr. Berg’s show. That night I had chills coursing through my body with almost every song. My psychology-minded wife can tell you the exact chemical process that leads to this bodily reaction, but for me, when I get the chills, I just know that I am experiencing something extraordinary. 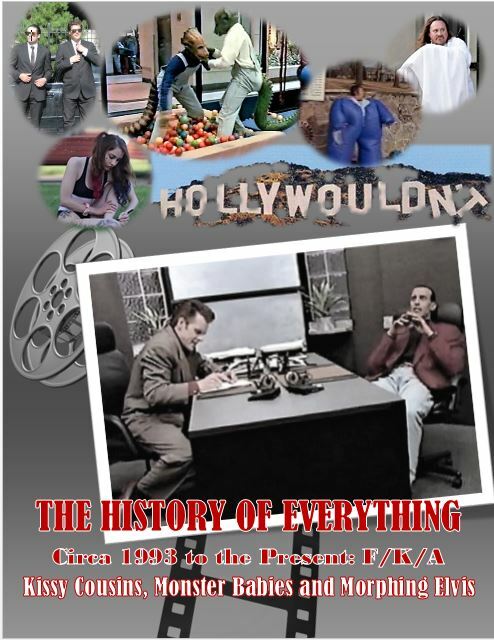 The show we saw featured Richard Todd Adams, Jeanette Bayardelle, Rita Harvey, and Danny Zolli. 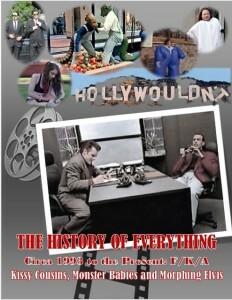 The structure of the show leveraged to the max all of their talents, past performances, and individual strengths. The result, of course, was an incredible night at the theatre. Danny Zolli, who can sing anything from rock, pop or Broadway show tunes opened the show with a rousing “December 1963” (“Oh, What a Night”) from Jersey Boys. He followed up with “Can’t Take My Eyes Off of You.” He changed up the Broadway tunes with the Simon & Garfunkel classic, “Bridge Over Troubled Water” that left many eyes watering. But he really showed his versatility when he played Sancho Panza to Richard Todd Adams’ Don Quixote singing tunes from Man of La Mancha. And speaking of Richard Todd Adams singing songs like “The Impossible Dream,” my goosebumps had goosebumps. He has a voice from God. I also loved his choice to do “This Nearly Was Mine” from South Pacific. 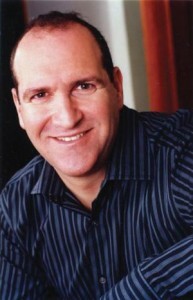 He is only a handful of actors who has played The Phantom, Jean Valjean, and Javert. His medley of Phantom classics with Rita Harvey was flawless. And now speaking of Rita Harvey, what a fantastic performer! As Mr. Berg was wont to point out many times, Ms. Harvey was his wife. 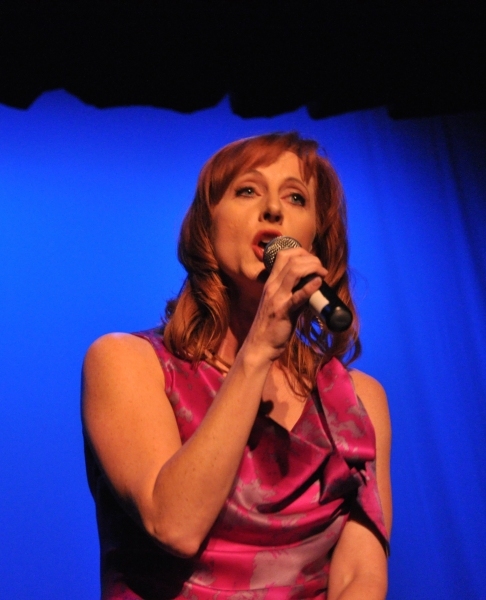 But she is also an incredibly talented songstress and Broadway actress. Her rendition of “Cabaret” had people on their feet and her take on the iconic The Sound Of Music (Maria) had our hearts in the Alps. 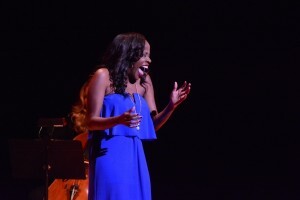 Meanwhile, AWARD WINNING Broadway star, Jeannnette Bayardelle, rode Aladdin’s Magic Carpet the entire night, effortlessly hanging notes in the air for unbelievable durations. Her “Ain’t No Mountain High Enough” from the play Motown had the crowd clapping and stomping. Her performance of Effie’s “And I Am Telling You I’m Not Going” had the entire house standing at the end. Standing ovations were indeed the order of the night. Kudos also should go to Mr. Berg for featuring local talent and Internet sensation, fifteen year-old Taylor Felt, who held her place on stage singing with these Broadway Stars. Mr. Berg was not only the Musical Director, but played piano and introduced all of the songs. He was backed up by Roger Cohen on drums and percussion and Abraham Saenz on Bass. The trio gave spot on, flawless accompaniment. A BIG Thank you! Must go to Christine Brown, Executive Producer and the new Artistic Director of The Bijou, veteran dramaturg Tony Stimic for bringing Broadway to Bridgeport. I cannot wait to see what’s next.